If you’d like to learn more from Troy about creating online courses, visit his new course rockstarempires.com, a brand new 6-week course where you’ll learn how to create and sell your very own online course like the one featured in this video. You can also visit WP Elevation to find out more about Troy’s training for WordPress consultants. Find out how Troy built and structured his course for maximum student engagement and high completion rates. Discover how Troy got started in the WordPress Community and how WP Elevation got to where it is today from the beginning. Learn why many online courses leave students feeling isolated and what Troy did to set his apart and solve this problem. Get an inside look at how some of their Infusionsoft Campaigns are set up (including their onboarding, drip feeding content, live coaching call automation, and other sequences). Find out the most challenging part of building WP Elevation as a site. Discover how WP Elevation was built with BuddyBoss Social Learner edition. Along with how it uses Memberium, LearnDash, BuddyPress and a combination of other plugins involved. Learn about an awesome way to use Intercom and Infusionsoft to automatically send dynamic personal messages to students as they progress through a Memberium based course. Get access to tons of other useful nuggets anyone running an online course can take advantage of. Micah: Hey, everybody. It’s Micah with Memberium, and today we go the pleasure of talking with Troy Dean. He runs a couple of companies, but WP Elevation is one of them. He has agreed to give us a sneak peak behind the scenes of his membership site and also share some insights about what he’s learned along the way of building it. Troy, thank you for joining us. Troy: Thanks for having me, Micah. It’s a pleasure to be sharing these insights. Micah: Well, cool, man. Again, we do appreciate this. Can you tell me just a little bit about your business? How you got started and where you are today? Troy: I started out as a WordPress developer back in about 2007. Usual kind of story – learning to use WordPress to build websites for my own projects. I was a musician and a voice-over artist. People around me started asking me to build websites for them, and then people offered to pay me to build websites for them, so I thought I better get my act together and learn how to do it properly. And then, I realized very quickly that WordPress has a bit of a steep learning curve if you’ve never used it before, and this is back at WordPress 2.2, so it was a completely different interface back then. I didn’t want to be in the business of training people how to use WordPress. That’s going to get pretty boring pretty quickly because you’re essentially running the same script over and over again to teach them how to use the interface. So I built this training manual to teach people. It was just a PDF to teach people how to use WordPress to manage their content. And then a buddy of mine had an idea to turn it into a plug-in with videos. So we did that. We launched it in 2008. It’s called Video User Manuals. That was going pretty well for a while just like a little side business. We had about a thousand paying users. We were selling it for about 24 bucks a month, and we also had a consulting business building websites for clients. Eventually, I kind of realized that the product business is where I wanted to be. So I doubled down and turned my attention full time to the product business and realized I had this audience. We had an email list of about 9,000 at that point, most of which hadn’t bought our plug-in. So I just reached out to them. I did some basic inbox market research and said, “Hey, what do you guys want? You’ve opted in for our e-book at some point, but you haven’t brought our product, and that’s cool. I’m not going to throw a tantrum or anything, but I’m just curious what’s going on for you guys?” And they all came back. So I started putting together some ideas and basically started documenting my processes. At that stage, I’d left my agency and I was back out as a freelancer. Eventually, we launched WP Elevation, which is a business coaching program for WordPress freelancers. We launched that in the middle of 2013, and now here we are 3 years later going very strong. It’s changed. It’s evolved. We have over 500 members in our program as we speak, and we’re about to roll out another launch of a course in a few weeks. So, that’s kind of the back story there. Micah: Nice. So, you’re like the O.G. on the WordPress side. Micah: How long have you used Infusionsoft? Troy: 2014, I think we pulled the trigger on Infusionsoft. It’s something that frankly I’d been wanting to use for a long time. I mean – let’s call a spade a spade. If you haven’t used Infusionsoft, but you’ve seen screenshots or video casts of the campaign builder, that’s what everyone goes gaga for. What happened is, I went to San Diego and I enrolled in one of Frank Kern’s courses called Mass Conversion. We got into Infusionsoft, and then all of a sudden you realize this thing is really powerful. It’s a massive learning curve. I’m not going to lie about that. My advice to anyone with Infusionsoft is do not do it unless you have time to learn it or you have the resources to pay a consultant to run it for you because it’s a huge learning curve. But, man, it is so powerful. So we pulled the triggered on it and then kind of did nothing with it for six months. We just got to know how to use it. We soon started gradually planning campaigns out one by one. Now, of course, it’s a behemoth, and our Infusionsoft is a complete mess and full of tags and complaints. Micah: I got you. It’s only been a couple of years. It will just got worse. Micah: We’re on the site now. Do you mind giving us just a general overview of the site, and maybe a walkthrough some of the things. Troy: Sure. Just a little bit of back story – what happened is, in June 2015, we had two years’ worth of content in this website. We run webinars and coaching calls every month for our members, and we had this thing called the Blueprint, which is essentially a series of processes and systems for running a WordPress consulting business. Really, they apply to running any kind of creative freelance business. So if you’re a copywriter, photographer, graphic designer, these processes are applicable. But we just happened to serve the WordPress freelance niche. So we had all these content, and I was looking for resources myself. I was looking for old coaching calls and webinars to reference, and I was logging into the members’ website. People just didn’t take action because they were overwhelmed with too much information. So, we shut it down. We shut the doors in July 2015 and we completely rebuilt the site from the ground up, and we now release our material and our training as a 6-week, drip-feed course – a very structured course. It’s kind of like if you enrolled in night school, you go along every week, you learn, you come home, you do your homework, you practice. You go back the next week, you learn new information. So, it’s a very structure 6-week drip-feed course. One of the things that I knew from doing a lot of courses online, buying a lot of courses online – I’ve bought just about every course that there is online, especially in the online marketing space – is that you still feel a bit isolated when you take a course online. What we really wanted to do was we really wanted to ramp up the sense of community because we knew that people who are really active in the forums stayed in the program. And if they stayed in the program, they continue to get the benefits. So I said, “The number one priority for us really is to ramp up the sense of community.” So we started wire-framing what we were going to rebuild. And about a month before we were due to launch, the guys over at BuddyBoss release this thing called Social Learner for LearnDash, which is what our new website is built on. So essentially, what happens is this: You buy the course. You log in, and this is what you’ve got on your dashboard. You have the Blueprint course on the left, and you have a Blueprint accountability course on the right. The accountability course is a bit of custom coding that we’ve done which essentially is just a checklist, a series of tick boxes that encourages you to do your homework. And so what happens is when you join the program, we partner you up with an accountability partner, and then you jump online with your accountability partner once a week or however often you want, and you just make sure that you’re both ticking off the accountability list. The idea is if you’ve completed the accountability course, then you’ve completed the actual Blueprint course, and you’ve got the stuff all set up in your business. So, what you’re looking at right now is essentially what you see when you log in. This isn’t the first page you see when you log in. I’ll come back to that in a moment. But one of the things that we built in is, as you complete modules in the course – so we got 6 weeks, 6 modules, one module per week – we unlock bonuses for you. “Hey, I’ve completed Module 1,” which is incoming. I think that’s already marked as completed. If I go to my next lesson, I went to the next module which is called Positioning, then I’ve actually completed all these lessons here, but I haven’t marked that off as complete. So, what I’m going to do now is I’m going to mark this off as complete. I’ve got all my green ticks here. I’m going to mark this week’s listing off as complete. And when I do that, I’m going to be redirected into the next lesson because this is actually available. In the real world, you’d have to wait. It would say, “Hey, this is going to be released in a few days.” But because I’m testing – this is a dummy user just to show me the next lesson. If I go back to my dashboard now, a couple of things happen. I’ve unlocked a new badge, which is my Positioning badge, which is the module that I’ve just marked off as complete. I’ve earned some more points here that helped me on my leader board, which I’ll show you a little bit later. If I go to the courses page sheet now and do a refresh, you’ll see that I’ve got a bunch of bonuses that have been unlocked because the tag that has been applied to my record in Infusionsoft after completing that module has now given me access to these bonus courses. The reason we do this is because we know from experience that when you roll out a 6-week drip-feed course, there are those people that just got in there and binge. They go, “Right, I’m going to complete Module 1 in two and a half hours,” because that’s roughly how long it takes to watch a series of lessons and complete the quizzes. And then they’re sitting there for 5 days going, “What do we do now?” and they get distracted and they lose focus. So we just continually release bonus courses for them. These courses really are past webinars that we’ve run that we’ve just cut up into miniature courses with quizzes. So they’ve got a whole bunch of content the can go on with, “Hey, cool. I’m interested in podcasting. I’m going to watch a little podcasting course. So that kind of constant engagement and constant carrot-dangling is one of the things that we’ve built in to make sure that our students stay super engaged. Micah: That is awesome. Do you email them saying, “Hey, you got a bonus,” or does that just appear here? How does that work? “Hi, James. Congratulations on completing Module 2. We just unlocked some bonuses for you to keep you busy and entertained until we roll Module 3 out in a few days. Go elevate.” That’s our tag line. So we email, we use Intercom to put dynamic messaging in there which I can show you in a moment. We used the Facebook group to keep them engaged because we know that some people don’t read emails. Some people don’t use Facebook. Some people don’t log into the member’s website and see the Intercom messages. We also use text messages to remind people about webinars and coaching calls. So we try and touch them at every possible touch point to keep them focused and keep them working their way through the course. I don’t know how deep you want to go in this, but there’s a few other things we do in terms of micro rewards and macro rewards to keep them working through the 6-week course. The test for us is we know anecdotally speaking to a lot of friends and colleagues that sell courses online, and also a lot of experience of buying and selling courses online that most courses that you sell online would get to around about 10-15% completion rate. Now, Seth Godin recently said on the Tim Ferriss podcast that his courses that he sells on Udemy and Skillshare had an 80% drop-off rate. So he’s only getting 20% of students to complete those courses on Udemy and Skillshare, which is just nuts because Seth Godin’s content is amazing. It’s like the best of the best. So we’re achieving about a 62-65% completion rate at the moment with our course, and I know that’s because we’ve just worked extremely hard about making sure that we keep them engaged and nurtured throughout the entire 6 weeks, and they feel like they belong to a class. We have a member saying, “I feel like you’re holding my hand like a tutor every step of the way, and I don’t know how you do that online. But I just feel like I’m at school.” It’s a really amazing sense of community and achievement. Micah: Yeah, that is amazing. I like using all the different mediums to reach them because you’re right – not everybody uses email, or checks this, or checks that. So tell me this – and we might get into even more of it, but you’ve got all these core things going on. What was the most challenging parts of building a site? Troy: What are the most challenging parts of building this site – that’s a really good question. I got to say, the BuddyBoss solution out of box does some amazing stuff. We’re really particular about keeping our members and our students focused on what they’re doing when they’re doing it. One of the things that we did is we have this events calendar. At the moment, I’m not seeing any events because I’m not actually set up as a proper user – I do apologize about that. But one of the things we do is we roll out coaching calls and webinars for our members based on where they live. So we have four coaches around the world. We have two here in Australia, one in the US, and one in the UK. And what we were finding is that our UK members we’re having to set up at 11 o’clock or midnight to get on a coaching call. So we employed these three other coaches – actually three of our best students. We brought them on as part-time coaches. And so now what we do is we roll out a coaching all in the UK, one in the US, and two in Australia. If you are in the US, when you log into your dashboard, you will see up here in the top right-hand corner the next event coming up, and it will be the US-based coaching call, and it will tell you the date and the time of that call based on the US time zone. If you’re in Australia and you want to see that call advertised to you, you’ll see the next Australian coaching call advertised. And that’s because we don’t want to confuse you. We want to talk to you because we know you’re a human being, and we know that you’re an individual taking these calls. You’re not just a number. So we don’t want to confuse you and expect you to get on a US-based coaching call if you live in Australia. The other thing we do is if you’re currently in the middle of the course, then you don’t get invited to any of the coaching calls or the webinars that aren’t related to the course. So during the 6-week course, we only invite you to the 6 coaching calls that are designed to help you get through the course. Once you’ve completed the course, then we invite you to our general webinars and coaching calls that we run each month because you’ve completed the course. But if you haven’t completed the course, you just don’t get invited to those calls because we don’t want to distract you. It’s unfortunate that I can’t show you, but this kind of banner that sits up here that advertises the next event, that’s a cool piece custom queering that we did from Infusionsoft and WordPress to make sure that we only show that banner based on where you are in the world and where you are in the course, if that makes sense. Micah: Yeah. So just out of curiosity, are you going off like their country field or you’re going off their IP address? How are you determining? So they emailed us and said, “Hey, can we be included in the Australian coaching calls?” because the Australian coaching calls for them are like 4 p.m. in the afternoon or something. And we’re like, “Sure.” So we just tag them with a specific tag, and then when we rolled the campaign out in Infusionsoft, which I can show you, they get included. So we have this thing called the exception tag, and they get included in the Australian coaching calls, not the US coaching calls because the US coaching call is too early for them. Micah: Nice. You mentioned one of the campaigns. Do you mind popping into some of the campaigns and showing us how those interrelate with the site? Troy: Here’s a very basic coaching call. What happens is you’ll get tagged with a tag at coaching call registration. Now, we have a bunch of saved searches in Infusionsoft. So what we do in Infusionsoft is, when you join the program, you got tagged with an intake number. So in September last year, you’re tagged Intake 1. February this year, you’re tagged Intake 2. And then when people join in June this year, they’ll be tagged Intake 3. And then based on your tag and whether or not you’ve completed the course, you’ll be put into a saved search. For example – this is a generic coaching call that we run once a month at iHost, and it’s for our members who have completed the course. Then what we do is we just tagged those people in that saved search in Infusionsoft. They get added to this coaching call registration and follow-up sequence. Now, what happens here is, from our experience of running webinars and coaching calls, which we used to do way back with Go To Webinars, we switched last year to Zoom for a whole bunch of reasons. What we used to do is we used to really struggle to get people on coaching calls because literally putting a registration form in front of someone and getting them to put their name and their email address and to get them on a coaching call kind of doesn’t make sense because I already know who you are. You’re one of our students. Why do I need your name and email address to get on a call? That doesn’t make sense. So, Zoom has this cool thing called registration-less calls where you don’t need people to register for the call. So, what we do is we just start this campaign. We remove a tag, and the tag is “WP Elevation Coaching Call Complete”. That’s just in case that tag was left on the record by accident the last month. We make sure that tag is removed. We then send them a welcome email, and the welcome email just invites them to the call and gives them the link to Zoom. And so we have a whole bunch of merged fields here. This merged field is the title of the coaching call. I’ll say, “Hey, Paul. I’d love you to join me on the coaching call next week.” This is the title and this is the description. This is the date here, which is a merged field. This is a campaign link. We set up time and date zone conversions for them, so they can just click on that link and they can see whatever time zone they’re in. This is a merged campaign link here, which is actually the log-in link for Zoom. And then we say, “We’re going to conduct this live via Zoom. If it asks you for a meeting ID, here’s the meeting ID,” and again this is a merged field here as well. So all that needs to happen for our VAs to run this campaign, is they just go into the campaign and they add the information to the merged fields here. And then I just add the merged links, the campaign links here, which is the time and date conversion and the actual zoom link there. The reason we do this is because it is more efficient that opening up multiple emails to add that information. And also, let’s be honest, the InfusionSoft email text editor is horrible, so it is really easy to make mistakes in there and get the formatting wrong, so we just get out the VA’s to drop the campaigns into the merge fields at the campaign level. And if they have registered, if they have opted in for SMS reminders, you can see the tag, if they are not opted in then we do nothing, if they are opted in, then what we do, is we send them into this campaign here, we integrate with Twilio, and that just pings Twilio to send them an SMS to remind them to get on the call, about thirty minutes prior. Then we have this follow up sequence which basically just says hey, a day-lighter, we say: “Hey, we have uploaded the replay into the member’s website, go and check it out. And then we remove some of the tags, so we remove the “SMS” tag, we remove the “registration” tag, you can see there, and then what we do, is apply the tag that says “Hi, the coaching call is complete” and the only reason we apply that tag there is because that is the tag that becomes the campaign goal which actually pulls them out of the campaign and the cycle is complete. Micah: OK, cool. So, for the new members, is that pretty basic, you are just generating a password, and sending them access to the site, or what are you doing there? Troy: Yes, for new members, we just—there is a script that we run, that generates a username and a password, adds them to WordPress, and then there is a welcome email they get with the login details, username and password. We also then have a follow up email, in fact I think it might even be in here, in the on-boarding emails. It is not on the on-boarding emails, there is another email that I send them personally with their login details, their username and password, so if they don’t get the that sends out—well they will, but if for some reasons it has gone to spam, I send them another personal email. I say: “Hey I personally want to thank you for joining the program and make sure you got your details, just in case you didn’t hear your login details. Here is actually the on-boarding campaign, that basically over a period of about ten days explains who we are, introduce our community manager Jean, explains the concept that we are going to be teaching in the course, shows them how to use the forums and the Facebook group, shows them how to use the members website, explains the leaderboard, explains the webinars and coaching calls, and then gives them a welcome from one of our alumni members who has been with us for a while as well. This is the on-boarding sequence just to nurture them and really get them settled down into the course and make them feel like they are part of the community. Micah: Yes, so this is interesting, anybody watching this, there is a lot of little things. Technically speaking, we haven’t dove into anything that nerdy, but, some of the little things about the accountability and you know, the coaching calls during the course and the webinars after the course and that. I am hoping that a lot of that is hitting you properly because these are pretty important and interesting things. I’m even learning a couple of little things and being reminded of a couple of little things. Let me ask you, so what exactly is the offer—we are talking about the webinars and coaching calls—what are you offering alongside the courses, what does your offer look like? Troy: That is a good question. So the offer is a six week course called the “WP elevation blueprint course”, plus twelve months access to our community program. That is what people buy when they enroll into our course. Course is $997 at the moment. It was $497 last September. It is now $997, it will eventually probably $1997 over the next twelve months as we improve things and as we on-board more people and get more feedback. So what they buy is the course, the six week course, they get a certificate on the end the course and they get a badge they can put on their website. I will show you in a moment. And then they get twelve month community –access to the community program. And the community program consists of two webinars, two training webinars a month, two coaching calls a month, so we basically run an event every week. We also give them what we call a bonus flight plan every three months. Our flight plan is just a miniature course. So for example, we just did one recently on selling website maintenance plans – had a package of your website plans and sell them to clients. That might be for or five lessons and might take an hour to go through that course so you can knock it off in one afternoon and one evening. But it is a bonus bit of training, based on what are members tell us they want. There is stuff on lead capture, there is stuff on cash flow, managing money, hiring staff, setting up maintenance plans. We drop at least one of those every month as a bonus, and of course access to Facebook or even the forums. The Facebook group is nuts, it is so active. What happens is, at the end of twelve months, you renew at $97 a month and that is optional. I can tell you we have about 50% returns, so once people are through the program, through the course, and they have their member ship for twelve months, then about 50% will stay, and the other 50% will say: “Hey this is not right for me right now, I am going to bounce out, I have got my value”. But what happens is, when those people bounce out, they are in agony about losing the community and the Facebook group. We have had so many people say can you please offer us a different price membership where we just have access to the Facebook group and nothing else. And of course, for us that doesn’t make sense, because all of the chat in the Facebook group is about the new webinars, new courses and the new flight plans that we are rolling out, so they would just be confused if we left them in the Facebook group. We know that the relationships that they build up in the Facebook group are really important to them. Micah: Got you. So, if I understood that right, and people have a lot of questions about one time fees or yearly or whatever. You are essentially selling one year access for $997, you don’t position it that way but it sounds that is what you are selling. Do they still have any access to the site after a year? A) more beneficial for them because they are going to get more value out of the program and they are going to be really embedded in the community and it is better for us because it increases our lifetime value, which frankly, allows us to hire more people and devote more resources to provide a better product. So at the end of the year, if they decide not to renew, what we do is we basically give them access to a sub-domain where they get the course they originally bought and any of the coaching calls that were at least during their time in doing that course. I think they even get—don’t quote me on this—but I think they even get a the bonus webinars that were released while they were in the program. They just don’t get access to any future webinars or couching call and they don’t get access to the forums or the Facebook group. So they just get logins to a sub-domain where they can still access the course that they originally bought. Micah: Ok, so they get kind of like their own personal archive, based on when they joined, of their coaching calls and webinars and the courses. Troy: Yep, exactly. And they’ve got lifetime access to that. Micah: Ok, awesome. What do you do for customer service, is it all intercom? Troy: No, for customer service, we have this help page here that we can kind of customize, it is just a bunch of accordions really. It is kind of Frequently Asked Questions about the courses, the webinars, the coaching calls, some guidelines to the forum, some billing membership details. We are just starting to build the perks section here. We kind of just—this will eventually become its own page but we are just starting to build a Perks page here. Some networking stuff, and then we have the support forum and the subject line. Now this all goes into desk.com, which is a salesforce product. We were kind of, when we started using desk.com a long time ago and kind of got grandfathered in some of the plans, so that is why we use it now. Depending on the subject line here that gets routed to the right agent in the desk, based on what it is they looking for. Then the processes—you know, if we get asked the same question three times, we will add it into one of these sections here because that will reduce our overhead. So we don’t use intercom for engagement really, we just use intercom to pin messages into the members website and remind our members about things that are going on. Of course I can reply here, but if I get rid of that, there is no help button, I can’ t click a help button here and ask a question via intercom. Micah: Ok, so that is cool. Tell me what is your best sale strategy for new members, it kind of sounds like you are doing a lunch model, is that right, and if so, is it traditional or? What do you do? Troy: Yes, so it was another thing that we did last September, I have been studying a lot with Jeff Walker, and I really wanted to do a product launch style, you know, PLF style launch. I heard all these things about—I wanted to execute one because I have been studying them for over a two years and I just want to get my hands dirty, just have a go at this and see if we can pull it off. I got to tell you, it is an enormous amount of fun making pre-launch videos, but it is an incredible of amount of work. I have massively underestimated what is involved. What we do now, we have pre-launch videos, so we will have three free training videos that are about 20 minutes each and are really good. They are like three about quickest wings that we can give our students, like three lowest hanging pieces of fruit if you like, they can pick from them. We give them the templates, we give them the proposal template, we give them a template for running a client meeting, and we give them an entire blueprint for running their business and whole bunch of free training videos around that. Then we open the program, we say: “Hey, you probably have a bunch more questions about what is this, and what do I do here, and what is in those emails and what does that template look like, and that’s what you get when you join the course. So we have like a two week worm up period of those free training videos and then we open the doors for seven days and then one those seven days are up, we shut the doors and then we close for four months, because we have three intake periods a year. In between those intake periods, we do a little bit of PPC advertising, predominately on Facebook at this stage, and a little bit on Instagram, where we drive people to blog posts and then we have PayPal sign up for one of our checklist or one of our templates that are just lifted out of the course. So you know, it is good old premium, kind of—here is enough value for free so when we open the doors, people will be like: “It must be super valuable behind the payroll, because you guys give away so much free content throughout the year”. We know that, because when our students join, one of the first question we ask them is: “What made you join in the end?” and they all say: “Well you have given us so much value over the last twelve months for free, I kind of felt obliged to join the program because I have learned so much from you”. Micah: Yeah, launches are insane, I mean you get in there and you set timelines for yourself and somehow you get behind and pretty soon it is: “Oh, I don’t need to sleep for the next three days”. Troy: Yeah, exactly, right on. I mean, I am really fortunate I don’t have kids at the moment, not yet, we are at the planning stages there and I have a very, very supportive wife who is just, you know I am like: “Hey babe, we are going into a launch”, and she is like: “Alright, I will see you in a couple of weeks”. [laugh] So you know, I am pretty lucky in that respect. We are just about to pull of two launches back to back, we are doing a launch for WP elevation, we literally close the doors on Wednesday night, and Friday morning we open the doors on a launch for a brand new product called Rockstar Empires. So yeah, it is nuts, but we are about to do two launches back to back. Micah: Nice, that’s nice. I can go on about that, but I will try to stay focused. You mention you are using the BuddyBoss Social Learner Theme, right? Micah: Tell me maybe then about what plugins you are using? Troy: Sure. Social learner for LearnDash theme comes — so let me be clear about this, so this is an important distinction I think. Because of BuddyBoss I have done an amazing job. But the Social Learner LearnDash solution is not a theme or a plugin, it is a solution. It is a series of plugins. So the Social learner, LearnDash in itself is a child theme of a BuddyBoss theme, and there it relies on bunch of plugins to work. And essentially the two core plugins that it requires are LearnDash, which is amazing learning management system for WordPress, Justin Ferriman and the guys that have made LearnDash, amazing job, I met him at WordPress Chicago a couple of years ago, he has got a lot of experience in selling LMS to Fortune 500 companies and then he brought that experience to WordPress and it is just—LearnDash is just, you know the LMS for WordPress as far as I am concerned. And another component is Buddy Press, which is you know, like the WordPress social network in a box. Typically speaking, Buddy Press, over the years has kind of been a little bit clunky—it is a great plugin, don’t get me wrong, but the interface has been a little bit uninspiring over the years. So the guys have at BuddyBoss, the first guys to really build beautifully looking premium themes specifically for buddy press. And know they have seen this opportunity that when you are learning online you still need that social interaction. Let me give you an example: My wife plays African drumming in the – she does African drumming two semester each year, just as bit of an outlet and a way to kind of lid of some steam. And in a middle of winter, she comes home from work and it is like: “You know it is cold it is raining, do I really want to get into car and go to African drumming. And she says: “Alright, I’ll go”. So because she knows that she is going to have some social network and she is going to haves some friends there, she keeps going to drumming. So why do we put a course online and not pay attention to that social experience? And the guys at BuddyBoss have nailed this with social learning. So integrating BuddyBoss and LearnDash basically means you can see what your fellow classmates are up to, you can see what badges they are unlocking. You know if I get back to my dashboard here, you can see here James Brown earned the badge as positioning badge. And you can see that one of your friends has unlocked the badge, you can see that we have uploaded a coaching call. By the way, this is the first page you see when you log in to our website. When you buy our course, this is the first page you see. Not the courses page, this is not he first page you see, the first page you see is the wall here, and the first question we ask you is:”what do you want to achieve today?”. We customize that because we want to invite people to become the part of the conversation as soon as they log in. So, BuddyPress, LearnDash, then there is a whole bunch of our little plugins that kind of do the heavy lifting, like the BuddyBoss wall, which we are looking at here, bbPress which we use for our forums. We use—we custom write our events calendar because we couldn’t find one that did exactly what we wanted to do, there is—what else—plugin wise that we are using. There is some BuddyBoss and LearnDash integration that you need, but which are all part of the BuddyBoss solution. And then there is – some custom stuff we did. The leader board is called, I am pretty sure that the leader board is BadgeOS. BadgeOS is another core plugin that we use, which does all the points and releasing of the badges. The BadgeOS leaderboard is what you are looking at here, and whoever is on top the leader board at the end of the month, wins a free coaching call with myself. That is based on engagement in the forums, completing courses, and also we will manually appoint the badges throughout the month by – how active you have been and if you have helpful to other members or if you added some value in the Facebook group. One thing that we custom build was the Members map which is being epic. So people login and they want to see where all the members are on the – who is near me, basically. So you can zoom in on this map. We have people all around the world organizing their own meet ups. We had a meet up in Washington recently on the East Coast, we had meet ups in California, we had meet ups in the UK. We had meet ups here in Portland. Because they can see: “there are enough of us here, we can all kind of get together and hang out and help each other”. This has been kind of a custom stuff that we did which has been really good. Another custom stuff we did in the “Members” directory, I think this comes out of the box, the “members” directory. But what we did is built this filter here, so you can add skills to your profile and then I can filter these. So if I am a developer and I am looking for designer, I can just tick “Designer” and hit “Filter” and I can see all of my fellow classmates who have put “Designer” in their skill set. Then I can add them as a friend, reach out to them and say: “hey Ally, I have got some work on, I need a designer, can we get on line and have a quick chat”, so there is really nice internal economy going on in the program as well because we facilitate this conversations as much as we can. Troy: No, but we could be. Micah: So I was going to ask about the custom coding, it sounds like the Members Map, the filters on the thing here, your calendar, little reminders for like localized coaching calls… What else was highly customized, if anything? Troy: The other thing, I will show you, the other thing that is really good is the Course Grid plugin from LearndDash. So this a plugin from LearnDash, that basically, as you add courses to LearnDash it just lies them out in a grid. And I tell you, this is the money shot, this is what everyone as a course publisher and as a student, everyone loves this, because it is just so beautiful and it is so well designed and it shows value straight away. We did a couple of things. We added how long the course is and how many lessons are in the course. And we have also added, if I have completed that course, you could see this green tick here, which actually shows that you have completed that course. So there is no need to revisit it, I am done with that. If I complete this lesson here, then a little green tick will appear there. Troy: … “Why can’t we have this work with other post types? So we have all our webinars and our coaching calls in our archives. We have 41 webinars in our archives. So we actually took the course grid plug-in and appropriated it for custom post types webinars and coaching calls. This is basically just like a custom-page template. So this is using advanced custom fields, which we love – ACF. Thank you very much, Elliot Condon, who is also a Melbourne developer. This is ACF, where we basically got a custom page template with the title of the call, the description, and the key takeaways. It’s just a basic text area. Then we’ve got our Vimeo URL, and then we have some lesson resources. So this styling is from the BuddyBoss theme, but we built this with ACF. So our VAs just say, “Hey, are there any resources for this call?” Yep, we’ve got a link here that we host on Amazon, a download here, and these are a bunch of links that were talked about during the call, and then we provide audio and video downloads. And I said, “That’s awesome, man. I really hope we can help in some way for you to do that.” So he spent the entire 2014, 2015 – a year – on a commute to and from work, it was an hour on the train everyday each way. So that’s 2 hours on the train every day. And so what he would do is he would download the videos here on to his iPad because he did not have 3G. So his iPad was offline. He would watch the webinars and the coaching calls on the train to and from work every day. He built a side business, turned up a 50 grand a year in that side business just building WordPress sites based on what he’d learned in our program. He sold his house in Melbourne in December 2015, and he’s now moving the family up to the Sunshine Coast, and he’s handed in his resignation in his job. So people go, “Really? Why do you need to supply audio and video downloads? Who’s going to watch them?” And I’m like, “You’re right. Not many people. But one guy did, and it paid off big time.” And so, I’m happy with that. Micah: That’s awesome. You know what you do a good job of, and I think everybody can take a note from is this is a webinar, right? Micah: And so a lot of people, they’ll take their webinar recordings, and they’ll just put them in a list somewhere. But where you’ve got a graphic per webinar, how you list the links below at the Downloads, you make it seem a lot more valuable and robust in the way you present it with the presenter on the side over there. Most people – myself included, I’m guilty of this – I kind of just tuck those away. I put them in archive or whatever, but I love how you’ve got them. If you go back to that webinar’s page for one second, you mentioned you used the course grid or whatever and kind of modified as you do this, but a lot of people have these many webinars. They’ve been doing monthly webinars, but they do not present them in any attractive form. So, this is just awesome. One of the things that we’re really conscious of in this business is, like the first 2 years, it was kind of the Troy Dean fan club. I don’t say that to be cocky or arrogant. I say that because it’s actually risky for the business, and it’s risky for our students if it’s all dependent on me. So one of the ideas with bringing in guest presenters and guest teachers was to say, “Hey, now you’ve got courses here by Cath, Mike, Kristina, Charles, Nathan, Jeanette, Dave Hobson, Mike and Troy.” It’s not just the Troy Dean show. It is a whole faculty of people coming in and teaching and adding tons of value. Micah: Yeah, it’s amazing. And it looks great. A lot of our clients, they’re not real technical, and so when I hear you talk about the custom coding, I feel bad for them because I know they’re going to see and want it. They can hire somebody to do it, but yeah, it’s cool. I’m sure training WordPress people, you know so much more about WordPress than most people. It’s beautiful. Troy: It’s funny you mentioned that because I was at at the Word Camp on the Sunshine Coast on the weekend, and I was chatting with my friend Dave, who’s moved his family up there. We’ve just had so much interest in what we’ve done here at WP Elevation that the next thing that we’re launching is we’re teaching a course. It kind of sounds a bit meta, but we’re teaching a course on how to make a course for maximum student engagement and completion. We know that there’s a bunch of courses on how to make courses, and there’s a bunch of software tools that you can use that make it really easy for a course teacher to get their course up on line. But our difference is that we actually care that your students complete the course. And of course, we have a whole bunch of WordPress consultants who’ve been through our program and understand exactly what we’re doing. And so what we’re doing now is we’re essentially training and skilling them up so that they can become BuddyBoss, LearnDash, Social Learner, Memberium, Infusionsoft experts because we already have students in the course on how to make a course. That whole thing is called Rockstar Empires. I already have students. They are knocking on my door and saying, “Can you please just do this for me?” And I’m saying, “Unfortunately, I can’t because it’s not my core business, but I can connect you with some WordPress consultants who can.” So, we’re going through that training process at the moment to make sure that they’re all following best practices and they can do some of these custom coding and custom tweaks. Micah: Yeah, very smart. As far as like with Memberium, we can’t help people with their sites. We can provide support, but we’re trying to grow that community of others who can help them as well, so same thing. Micah: Yeah, exactly. It’s like, “I want to help, but I can’t.” So a couple more questions – what are you plans for the future at this time? You’ve gotten this far. What do you plan on doing to the site? Troy: The site continues to evolve. The one thing that we’re about to launch is a Wiki, which is another bit of custom coding. Essentially, it will start off as the resources page, and the resources page will just list all of the resources, blueprints, templates, and downloads that belong to each section of this course here. So this course is broken up into 7 chapters essentially, and all of the resources for each of these 7 chapters will be broken up and grouped together, and that resource page will eventually become a Wiki, where our members will be able to edit it and add their own pages. That’s great, but 6 months later, you go and try to find that in a forum or Facebook group somewhere. So we want our users to be able to add that stuff to the Wiki. So we’ve already custom-built the resource page, and we’re already custom-building the ability to turn that into a real user-generated Wiki. And we have, as I said, 3 intakes a year with WP Elevation, and this site will continue to evolve as our students come in and tell us what is valuable for them, and while we monitor our tune rates and our lifetime value, we will still be involving the blueprint. My hope is that in 18 months to 2 years, that the blueprint will be unrecognizable to me because it would be full of feedback and advice in templates and good from our students who have actually taken this and used this in the wild, that it’s become something bigger than me. The product is greater than the sum of the parts, if that makes sense. So we will probably partner with someone or several people to add those technical courses to the platform because the mission is that WP Elevation will be the education company for WordPress consultants. This is the only place you need to go to get everything you need to run a WordPress consulting business. So, that’s the long-term vision for WP Elevation. Micah: Gotcha. Well, I like what you said about at some point being something that you don’t recognize, that’s like the whole life cycle of a membership site if you can extract yourself from being the thought leader. It’s beautiful. I have one more question for you. I don’t know if it will be difficult for you to answer because you have such a breadth of knowledge, so I’ll just go ahead and ask it. Do you have any advice for anyone who wants to start a membership site in the short version – the 1-minute advice? Troy: Yeah, I do. Get really clear about your mission and your vision, and who it is you serve, and manage your expectations, and understand that membership sites are not sit-and-forget. They are not a path to passive income. 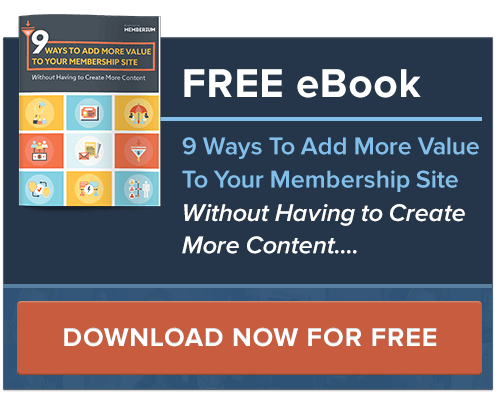 If you have a membership site and you expect people to keep paying you a monthly membership, you need to over deliver on the value every month. So our mission here is to deliver enormous value to our customers and then optimize our business internally, so that we can continue to do that and remain profitable. And that requires an enormous amount of work, processes, and a great team who are all aligned and all moving in the right direction. It is not easy and it is not a sit-and-forget path to passive income. Micah: Man, you get a gold star for that. That was perfect 1-minute advice. I love it. I know you’ve got a lot more there. So, Troy, thank you. You’ve been so generous with your time and showing us what you’re doing, and your information and knowledge. I know you’ve got WP Elevation obviously if they’re interested in doing anything with WordPress professionally, they should go there. But you mentioned something else to me. Can you tell them about that as well? Troy: Yeah. So we’re about to launch Rockstar Empires, which is a whole new brand, and it’s where we are teaching anyone who trades time for money. So, if you’re a consultant of any sort, or a creative service provider of any sort and you’re currently trading time for money, we’re teaching you how to take the knowledge in your head and turn that into a course that is designed for maximum student engagement and completion, and then how to get that course up online and how to start selling that course, so that you can supplement some of your income and maybe – like what I’ve done over the last 3 years – move away from client services to be a complete online business where I don’t service any clients anymore. What we do is we generate our revenue through teaching and selling courses. It’s a course on how to make and how to sell a course, and that’s at rockstarempires.com, and that’s about to launch in mid-June 2016. So we’re really looking forward to that. Micah: Awesome. Cool. I think anybody watching, they should know by now after listening to a lot of the advice you’ve given, you give it so matter of fact, but there’s a lot in there. I mean there’s a lot of nuances. I only drew attention to just a couple, but there’s so much in here, so I’m sure that course is going to be really amazing. I’ve talked to a lot of people and I’ve been to a lot of sites, and typically it’s someone who was expert on something and they built a site and they’re doing well, and so they share their secrets, which is really good. But I don’t know if I’ve met anybody with the knowledge of WordPress in the technical and a really deep knowledge of how the stuff works because this is not a surface level like, “Hey, if you do badges and certificates, you’ll do better.” So, the nuances are wrapped around that. I’m really looking forward to the course, and I recommend everybody watching this to check that out because this man is a genius. Micah: You’re welcome, man. Anything else you want to share with them? Troy: One other cool little thing we do is Memberium is great at tagging our students in Infusionsoft so we know what they’re up to. But then what we do is we use this great thing called Zapier, where we grab those tags from Infusionsoft and we push them into Intercom. I won’t go into the details, but Zapier is just unbelievable if no one has used it in terms of– I know you can kind of do some more funky stuff with Intercom. But we’re kind of lean at the moment, so we move pretty quickly. So, the quickest way for us to do this was to take a tag. If you’ve completed a module, you’re tagged in Infusionsoft. We then push that through the Intercom, and then we have these segments of people set up in Intercom since we got 375 users match that segment, and then we can just send them a message like you saw before that says, “Hey, congratulations. I’m completing Module 2. We’ve unlocked your bonuses.” So I would strongly suggest everyone look at Zapier and ask yourself how that can help automate your business as well. Micah: Genius. Awesome, man. Well, thank you again, Troy. I’ll put up links to some of the resources you mentioned underneath the video. Everybody, if you’ll check WP Elevation, and then also rockstarempires.com. Thanks again, Troy. I appreciate it. Troy: Cool. Thanks, Micah. Thanks for having me.